And now for something completely different, as Python’s brother Monty used to say. I shy away from contests because they tend to be exploitative: artists get taken advantage of. On the other hand, a contest can provide an artist with valuable publicity– so there’s room for debate. Back in August, I surprised myself by entering a contest sponsored by Fluevog Shoes. The challenge: design an ad for their new shoe, Truth Genevieve. Including copy was optional, since the winning ad would be run inside a frame which contained all pertinent written information. It’s a takeoff, of course, on the story of Adam and Eve, as recorded in Genesis, the first book of the Bible. Before going further, I must emphasize that it is not meant to ridicule the Bible or religion in any way. 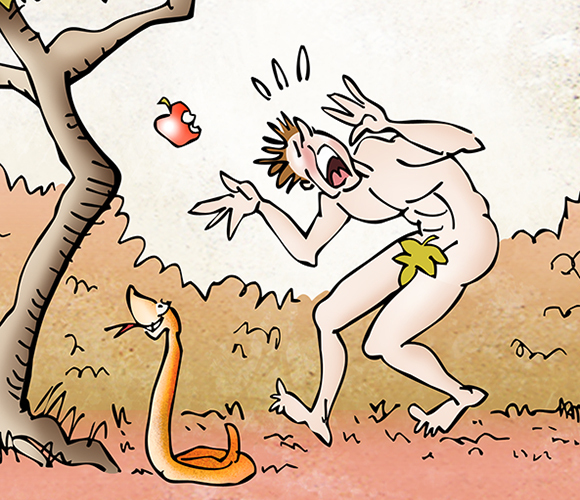 Most cartoonists have, at some point, tried their hand at an Adam and Eve cartoon. Most of these cartoons are affectionate parodies. I intended my Fluevog ad to be exactly that. So why did I decide to enter the contest? I received an email from Claire Porter, a friend of mine who also happens to be one of the world’s most inventive performance artists. Turns out Claire likes Fluevog shoes, and actually wears them in some of her routines. She had heard about the contest, and urged me to enter, saying she thought my design “would be THE BEST!! !” Blush! Nothing like flattery to make a guy reckless. I decided to jump in. Fluevog contests are ongoing. They run for about 4 weeks. Artists submit their designs during this period. Once the deadline passes, John, the owner, picks his four favorites. These are moved onto a separate page, and “Fluevogers” then vote and determine the winner. If your artwork is chosen, you will become an official FluevogCreative, receive a bio on Fluevog.com, have your ad, name, & URL showcased with a minimum of 250,000 printed impressions in classy magazines, and receive a $1,000 Gift Certificate to John Fluevog Shoes. If your Design is selected for use by Fluevog, you acknowledge that you assign to John Fluevog Shoes & Boots Ltd. and its subsidiaries and affiliates (hereinafter collectively “Fluevog”) the entire right, title, and interest in and to the copyright in your Design including the right to sue for past infringement and the right to further sublicense the Design, for its sole and exclusive use on and in connection with the Items. You also acknowledge that you waive all “moral” rights that you may have in and to your Design. You get publicity and $1000 worth of shoes. You give up all rights to your work. So I won the contest, right? Uh, no. But I did get selected as one of the finalists, right? Uh… sadly, no. There were a total of 56 entries, these were the four finalists. Take a look, then scroll down to see the winner. Here’s the winner, and I did vote for it myself. Simple, striking, colorful. if you are looking for some, here are some words/copy we have used in the past, which you are free to use. It went on to list Truth and Integrity since 1970, Unique Soles for Unique Souls, and several other catch-phrases. in contrast to my own “long shot” image. Ah, well– a good learning experience. 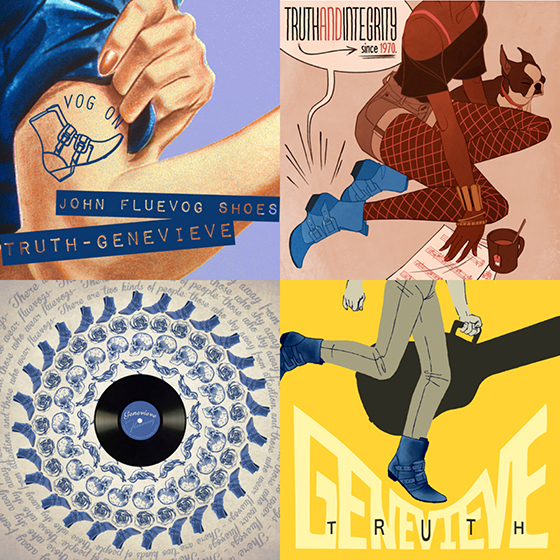 You can see all 56 entries in this Truth Genevieve gallery. What do you think? Is it worthwhile for an artist to enter this kind of contest? Ever entered a similar contest yourself? Hope you’ll leave a comment. Andy Warhol Meets Film Noir: Biff, Bang, Pop! A pot at the end of the rainbow… that would be great! That way, if I ever win $1000 worth of old sneakers, I’ll have a place to put ’em! Excellent!! Absolutely, I think it’s worthwhile for you to enter contests. You are an amazing illustrator. I love your ad, and I was sure you were going to tell us you won. I think your final evaluation was spot on – the “long shot” and prominent placement to the shoe. A good learning experience indeed. Nice job, Mark. There’s no escaping the fact that my “long shot” design resulted in very small images of the shoe. A risky approach, visually, when one’s aim is to sell the shoe. So yes, a good reminder: commercial art has to deliver the goods, make the sale. There’s nothing unfair about it, that’s the nature of the business– even when that business takes the form of a contest. A big you’re welcome to a very kind guy! It’s easy to show support when the work is outstanding. Well Mark, if it was a funny illustration wanted, yours would have won hands-down…! Very, very funny indeed…! However; seems they were after a more ‘serious’ and conservative design. In answer to your question: I would think it a good idea to ‘put yourself out there’; you never know who may be watching…! OK, another vote for yes, enter them, contests can boost your profile. Very good. And you’re right: who knows who might see your work and say: that’s just the style I’m looking for. I chuckled. I do know some women that really love their shoes, and would probably utter something like “those are so cute,” too. I wasn’t offended in any way. I thought the reference was clever, but I am a religious and Bible-reading sort, so I have room to relate, I suppose. No, really, what I gathered from three of the four finalist illustrations was a message of creativity and power– and I think that’s part of what propelled the winning pick. It’s probably easiest for me to speculate what other things helped that pick– a bold and very prominent placement of the shoe, an Art Deco meets Punk sort of look that seems to mesh well with the Art Deco designs on their website, and a VERY catchy phrase they might well pick as their new slogan. Then I would say the others had feminist and folk singer girl vibes, somewhat in common. The winning pick, though, wasn’t too kitschy, political, or niche. Now, Mark, I do love your design and I liked your retro theme. I don’t think I’m old enough to have seen ads like this when they were new, but it really does look like something that could have come out in the late ’60s or early ’70s, compared to some examples I’ve seen. But I have a feeling Fluevog Shoes wants to make sure they appeal to their younger demographic and that therefore they wouldn’t be able to appreciate your design as much. Really, I think that’s the main thing, if I fancied myself a marketer. Yes, maybe you too saw the New Yorker cartoon on this very theme, that was banned because the artist dared to show understated cartoon boobies and a lot of leg… but I sincerely doubt that much crossed the minds at Fluevog. Nor do I think they were terribly worried about it being a Biblical reference, unless some have become a lot more hypersensitive these days. Some very astute observations, Jak, thank you very much indeed. Your point about the winning design meshing well with the designs already on the Fluevog website really jumped out at me. In retrospect, that seems like something I should have done first: check out the existing Fluevog “look.” Stands to reason that having established a visual identity, Fluevog would hardly be inclined to pick a design that deviated radically from its established look. I missed something very obvious there (insert numerous head slaps here). You’re quite welcome. Hindsight is 20/20. I had a somewhat similar experience with a buddy that I’d paint the town red with. A local bar needed a logo design and I came up with a very classy picture of a pool table with a rose on it. I went back and found out they decided to go with a cartoony-looking tequila worm. So… been there, done that! My favorite are exotic Indian sandals, bought them four weeks ago in South India, they remind me how I spent two fantastic weeks in Varkala. Hi, Mark, Bob just sent this piece to me, and I did not know that you were the artist until I had puzzled over why Bob would send me this funny cartoon about really ugly shoes. (Shows how fashion conscious I am.) It was great fun to meet you. I’m still laughing over your “ugly shoes” quip. Thanks so much for stopping by, you’re a treasure! But then again, you knew I’d say that! I enjoyed your illustration and thought the drawing was superb and the humor great. I’m not attracted to the winning entry or its drab color palette (which, of those colors, seems to be popular right now with graphic artists). I didn’t notice the dog until I had a third look, and now I’m wondering why it’s in the illustration. What was John, the company’s owner, thinking? Many thanks, Steven, very sincerely appreciated. Coming from a wonderful painter and artist like yourself, that means a lot. Your point about the color palette of the winning design was interesting. I liked the colors– they remind me of the rusts and deep reds you see on mums (chrysanthemums), a very popular fall flower here in New Hampshire. But the overall color scheme seemed dark. In fact, there wasn’t any white space on any of the four finalists– which seems both odd and significant somehow. Again, many thanks for your wonderfully supportive comment! Poor extraneous doggie! He’s taking some hits here. He certainly blends in well, though– so well that apparently most people can’t see him! Great post, good food for thought, especially for young artists trying to figure things out. Like you stated, there are pros and cons. It can be good publicity but aside from that you can feel real cheated and used. There should have been much more offered for such creativity expressed toward their product. I have entered contest/competitions in the past, I only enter the ones that are beneficial. Currently I have entered the Bombay Sapphire Gins contest, which I am waiting on the voting to end in mid-November. Your ad was dope! You went there. Many thanks, I’m very happy you enjoyed the post. So I googled it and found that the Urban Dictionary defines dope as “extremely cool”– this was welcome news!! I’m not surprised the winning entry won– it feeds the egos of the chic and those who think they are daring… fashion-wise. I enjoyed your entry… certainly way more spirited than some others!! And John Fluevog is a bit of a shoe design maverick. He’s based in Vancouver, BC I believe. Movie stars sometimes want his shoes. As for entering contest, only each illustrator can judge the time-worthiness by pondering over the subject, intent, etc. I’ve also learned that art contests can be subjectively maddening. I once lost a contest to a rock with a ceramic tile glued to the top. You never know. I did like your message and the way you conveyed it. Keep up the great work. I agree with you that it’s a bit iffy when a company says they’re somehow doing you a favor by making you submit your work for free. I’ve been offered several opportunities to sign over the rights to my work for stuff like this, and I would rather not. (That is if I’m understanding the offer correctly). They do appear to give a form of “payment” via shoes, but who would use that much? I think the winning artists portrayed modern, independent women, and that certainly appeals to a woman in 2012 who wants to be appreciated not as a googly-eyed girly girl wanting shoes, but rather a working person who likes to buy things just like anyone else. Well, I suspect the average price of a pair of Fluevogs is probably a good bit more than the $2.99 I pay for my sneakers, so perhaps the $1000 wouldn’t go very far. Dunno. Wow, your work is brilliant!!! Simply inspiring, i’ve never seen the retro created in a way that I actually find pleasing… You should have won from what I can see!! Also, wow, on the fact of ‘moral’ rights! What are they saying… this is ludicrous… i’m not sure I could enter a contest with losing all rights to my own work… hard choice. Good for you to enter the contest, Mark! Yours is quite intriguing and paradoxical at the same time perhaps. As we all know, Adam and Eve were punished in the Bible stories. 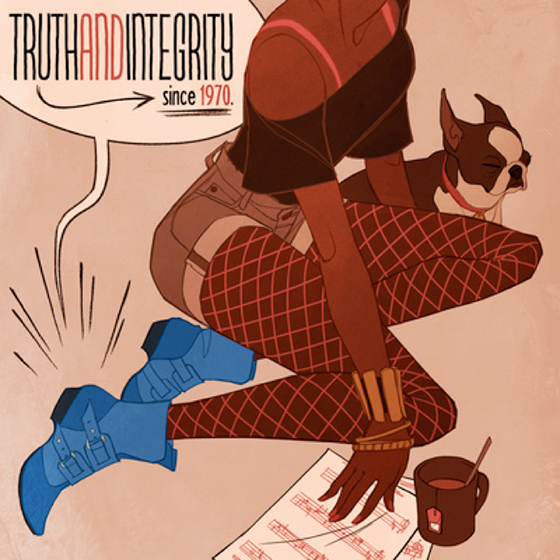 And therefore your illustration seems to tell the audience that it’s wrong to have the Truth Genevieve shoe. Even if you didn’t make it to the final cut Mark, your illustration still has the amazing factor it always has! When I saw the final entrants I felt the winning one was really well done as well. The subtle colours with the striking blue, I wouldn’t think brown and blue would ever go together! You make a great point about brown and blue. I don’t think I’d have considered that color combo in a million years! Startling to see what works sometimes. Conclusion: it pays to experiment and check out other people’s work. Yes, I do remember your entering those competitions, and how hard you worked on your entries. No doubt about it: takes a good bit of nerve to put the ol’ ego on the line and compete. You’ve summed it up beautifully: treat competitions as an opportunity to learn, bring your new skills to the next round, keep getting better.